Anders Fogh Rasmussen has been at the centre of European and global politics for three decades as Secretary General of NATO, Prime Minister of Denmark, Danish Minister of Economic Affairs, Danish Minister for Taxation and a leading Danish parliamentarian. During the Danish Presidency of the European Union in 2002, he played a key role in concluding accession negotiations with 10 candidates for EU- membership. 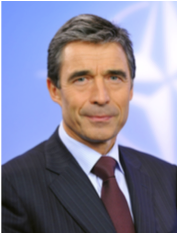 In 2009 Anders Fogh Rasmussen was appointed NATO’s 12th Secretary General between 1 August 2009 and 30 September 2014. His tenure in NATO marked a fundamental transformation of the Alliance. He oversaw the Alliance’s operational peak with six operations on three continents including Afghanistan, Kosovo and Libya, as well as counter-piracy along the Somali coast, a training mission in Iraq and a counter-terrorism operation in the Mediterranean. He developed a new Strategic Concept, which sets the Alliance’s core future priorities and he launched “Smart Defence” to help nations make more efficient use of their resources through more multinational cooperation. In response to Russia’s aggression against Ukraine, he initiated a “Readiness Action Plan” to strengthen the collective defence to an unprecedented level since the end of the Cold War. On 1 October 2014, Anders Fogh Rasmussen established Rasmussen Global. The firm advises clients on a wide range of issues such as international security, transatlantic relations, the European Union, and emerging markets. Rasmussen Global draws on an extensive network of leading policy experts, former officials, business executives and consulting firms across the globe. On 1 June 2016, Mr. Rasmussen was appointed advisor to the President of Ukraine, Petro Poroshenko. Anders Fogh Rasmussen has advocated stronger ties between the world’s democracies, including a truly “Integrated Transatlantic Community”, a Transatlantic Free Trade Agreement between the EU and North America, and a global community of democracies. In 2017, Mr. Rasmussen founded the Alliance of Democracies Foundation, a non-profit organization dedicated to the advancement of democracy and free markets across the globe. In this role, he hosts the annual Copenhagen Democracy Summit, and chairs the Transatlantic Commission on Election Integrity, which, among others, inlcude Joe Biden, Michael Chertoff, and Felipe Calderon. Mr. Rasmussen holds a Master’s degree in Economics from Aarhus University, and speaks English and French besides his native Danish.